"If I take one more step, it’ll be the farthest away from home I’ve ever been." – A connection with his beloved West Midlands by calling Rohan “The Mark”. Furthermore, the correspondence is even more apparent from the Rohirric chapters of “The Lord of the Rings”, especially with the chapter “The King of the Golden Hall”, which is straightforwardly calqued on “Beowulf”, both in language and theme. The subject of Anglo-Saxon influences on the creation of the Rohirrim is a huge one, and one that cannot be covered fully in one article, so here a few simple examples are put forward. These are the use of mead-halls and the behaviour of those in mead-halls, characters in the king’s household, language, and fate. Tolkien’s main source for the nation of Rohan was “Beowulf”. Beowulf was composed by an unknown Anglo-Saxon poet in around 700AD, basing the tale on events of history and stories that had already been known for many years. It was written at a time of great change of Europe, the writer being a Christian, and imposing Christian values on characters that would have been pagan. Only a single manuscript of “Beowulf” survived the Anglo-Saxon era. For many centuries, it was all but forgotten, and, in the 1700s, it was nearly destroyed in a fire. In the 1800s, it started to attract interest among scholars and translators of Old English, their primary interest being historical. It was not until 1936, when Tolkien published a groundbreaking paper entitled “Beowulf: The Monsters and the Critics” that the manuscript gained recognition as a serious work of art. But many of the characteristics of the people of the Riddermark are found in other sources, such as “The Wanderer” and “The Battle of Maldon”. “The Wanderer” is thought to date back to the sixth century, and is a lament for the dead and the glories of the past. The narrator of the poem has lost his kin in battle and is wandering alone and contemplating the temporal nature of life. The narrator’s lament also displays the permeating cultural belief that everything in life is predetermined by fate. “The Battle of Maldon” is known from a 17th-century copy of a now-lost and incomplete manuscript of an Old English poem about the conflict. The battle of Maldon was fought in August 991 between English forces commanded by Byrhtnoth, Ealdorman of Essex, and Vikings raiding around the east and south of England. It is one of the finest Old English battle poems, and gives clearest expression to the heroic ideals of Anglo-Saxon England. There is constant reference to conventional, ancient heroic ideals: loyalty, vengeance, fighting for one’s lord. The first parallel between the Anglo-Saxons and the Rohirrim is the concept of the mead-hall. Indeed, the word meduseld in Anglo-Saxon means mead-hall. Mead-halls were places of warmth and communality, away from the cold and windswept outside. 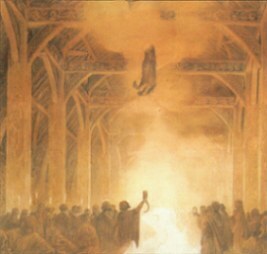 Under the protective wood of the hall’s steep gables, fires blazed and people feasted, drank and sung. When one thinks of how a mead-hall must have been a symbol of all that was safe and warm in both Anglo-Saxon lands and the Riddermark, it is easy to see how devastating Gríma’s treachery must have been, changing that wonderful safety into suspicion and worry. 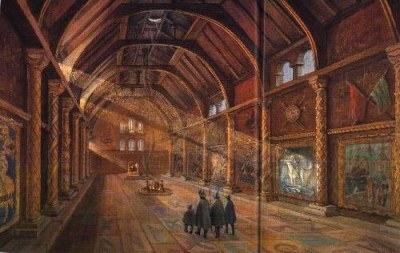 And when we first hear of Meduseld, Legolas’s words clearly show the importance of the Hall – the Golden Hall of the Lord of the Mark, on a hilltop, looking out protectively over the land. As an aside, Legolas’s words “The light of it shines far over the land”, are a direct translation of line 311 of Beowulf, “lixte se leoma ofer landa fela“. Beowulf and “The King of the Golden Hall” agree, down to minute detail, on the procedure for approaching kings. Each party approaching the mead-hall has two challenges – by a coastguard and then a doorwarden in Beowulf; and by the Edoras gatewarden then Háma in “The Lord of the Rings”. The doorwarden then takes their names in to the king. Giving of gifts was a traditional and essential part of Anglo-Saxon mead-hall life, with the kennings for a lord generally revolving around that theme – ring-giver, gift-giver, treasure-giver. 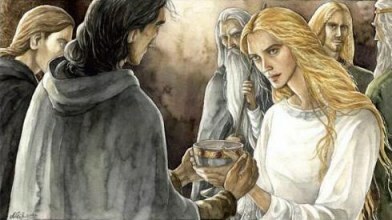 Gift-giving occurs also in “The Lord of the Rings”, after Théoden’s healing. Gandalf asked for Shadowfax, and they are all given their pick of armour. Gimli picked a helmet that had been Théoden’s when younger, in the same manner that Beowulf was given arms and armour from both Hrothgar and Heorogar. The correspondence of characters in “The Lord of the Rings” and the Anglo-Saxon works, especially “Beowulf”, is the subject of an article on its own, so here is just a brief overview. or for facing danger on the field of battle. Hrothgar’s queen, observing the courtesies. … it was Beowulf’s turn to take it from her hand. The first real glimpse into the Rohirrim is provided by Eorl’s Hymn, a tale of the first king of the Rohirrim, inserted into the narrative of “The Lord of the Rings” in a fashion similar to the “Lay of Hildeburh” and the “Tale of Sigemund” in Beowulf – a memory of the past. Though, of course, in Beowulf the tales are cautionary, in “The Lord of the Rings”, they are lauditory. There is a fantastic article in Elrond’s Library Literature Studies section about Eorl’s Hymn. A link is here. Sank into silence, so the songs tell us. The Rohirrim are also distinctly reminiscent of the Anglo-Saxons in their view of life, where events and people are governed by fate and doom. And this idea is brought out in the Mark from the start, when Gandalf and the others see the barrows covered in simbelmynë – the burial mounds of kings, reminding all of death, but also of the lineage and glory of the Kings of the Mark. Both the Rohirrim and the Anglo-Saxons of song have a very fatalistic attitude to life. Their lives are governed by their doom, death is expected, even awaited, and a glorious death which is remembered in song is the ultimate accolade for a brave warrior. We can see this in the old poems and in “The Lord of the Rings”. Théoden perfectly encompassed these values – albeit with one major twist that clearly increased the courage of his later actions. The twist, of course, was his seduction at the hands of Wormtongue and Saruman, and his rejection of those whisperings to become the king he needed to be.